BACKGROUND: Publicly funded prescription drug programs, such as state pharmacy assistance programs, provide critical benefits for the care of individuals, but they are frequently limited in their resources to optimize patient outcomes. 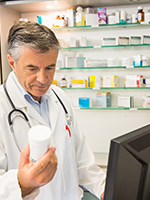 The application of quality metrics to prescription drug claims may help to determine whether prescribers’ adherence to national standards can be augmented through academic detailing. OBJECTIVE: To evaluate changes in diabetes drug prescribing patterns after an academic detailing educational intervention in 2013 and 2014 for prescribers in the Pennsylvania Pharmaceutical Assistance Contract for the Elderly (PACE) program. METHODS: We used a retrospective, quasiexperimental study design that applied interrupted time series and segmented regression analysis, and examined PACE pharmacy claims data for 1 year before and 1 year after the academic detailing intervention. Four diabetes prescribing metrics were evaluated at monthly intervals for a sample of 574 prescribers who received academic detailing and for a propensity score–matched comparison sample of 574 prescribers who did not receive the intervention. RESULTS: The prescribers who received academic detailing did not differ significantly after the intervention from the providers who did not receive the intervention in their prescribing trends for the 4 diabetes metrics. The observed time series patterns suggest that diabetes-related ceiling effects were likely, with relatively small room for improvement at the group level during the study period. CONCLUSION: The results of this study did not demonstrate group differences in prescribing trends that were attributable to the intervention. However, many prescribers in the detailed group had been exposed to similar educational outreach by PACE before 2013, which limits the interpretation of this finding. In addition, the diabetes quality metrics had been the standard of care during the preceding decade, with a broad dissemination of the treatment guidelines to the provider community. These results are consistent with a ceiling effect in the measured metrics, suggesting that most prescribers in both groups were largely following core diabetes guidelines before and after the intervention. Published reports are encouraging regarding the benefits of academic detailing across diverse health issues, including smoking cessation, alcohol use disorder, influenza vaccination, and improved antibiotic prescribing.7-12 Systematic reviews of academic detailing include a Cochrane review that showed improved prescribing with the use of academic detailing.13,14 In 2010, the Agency for Healthcare Research and Quality funded the National Resource Center for Academic Detailing in an effort to support educational outreach and improve clinical outcomes. The Pennsylvania Department of Aging has partnered with Alosa Health and Alosa Health’s Independent Drug Information Service to provide academic detailing services for the Pennsylvania Pharmaceutical Assistance Contract for the Elderly (PACE), a state-funded program of prescription assistance for income-eligible elderly residents.15,16 Alosa Health provides academic detailing module training, material development, detailing visits, quality metrics trends, and project coordination for PACE. This academic detailing program was started in 2003 with the Healthy Bones Project.15,16 Today, the program seeks to provide unbiased evidence-based information by delivering 3 educational modules annually through approximately 2600 primary care provider visits. The goal of the program is to support providers with nonbiased, evidence-based information so they can optimize medication outcomes for their patients. The PACE academic detailing program includes 4 separate modules devoted to diabetes, which were delivered in 2007, 2009, 2013, and 2016. These 4 diabetes modules were designed to promote evidence-based care for pharmacologic and nonpharmacologic treatment approaches. The effectiveness of these diabetes-­focused detailing efforts has not been previously evaluated in Pennsylvania. The goal of our study was to evaluate diabetes prescribing changes that occurred as a result of the third diabetes educational outreach intervention, which took place in 2013 and 2014. The application of quality metrics to prescription drug claims may help to determine whether prescribers’ adherence to national standards can be augmented through academic detailing. Using metrics based on Medicare-validated standards for the treatment of patients with diabetes, the impact of academic detailing on prescribing patterns was studied using PACE prescription drug claims data during the year before and the year after the educational outreach intervention. We used retrospective interrupted time series with segmented regression analysis to evaluate changes in 4 diabetes prescribing metrics after the educational intervention.21,22 Using PACE pharmacy claims data, prescribing was assessed within twelve 30-day intervals (360 days) immediately preceding the intervention (ie, the preperiod) and twelve 30-day intervals (360 days) immediately after the intervention (ie, the postperiod). The interrupted time series analysis was conducted on a cohort of active prescribers who received the intervention and a propensity score–matched comparison group of Pennsylvania prescribers who did not receive the intervention. The general academic detailing intervention approach as applied to the PACE program has been described elsewhere.23,24 The present evaluation focuses on the impact of the diabetes education module that was delivered to prescribers in 2013 and 2014. During encounter visits that averaged 20 minutes, detailers provided the module-based training, emphasizing key messages, and shared the evidence document. The key messages of the education module included the importance of lifestyle modification, individualized hemoglobin A1c targets, and the benefits of metformin as first-line therapy for most patients. 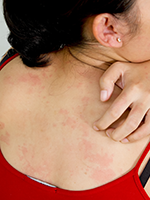 The module also addressed the management of comorbid conditions, such as hypertension and hyperlipidemia, through the use of angiotensin-converting enzyme (ACE) inhibitors, angiotensin receptor blockers (ARBs), and statins. A total of 704 PACE prescribers received the diabetes educational module between March 5, 2013, and July 1, 2014. Because the goal of the evaluation was to assess changes in prescribing patterns after training, a subset of 574 consistently active prescribers was identified for the evaluation analysis. This active prescribing subset included all prescribers who received the intervention and were the prescriber of record on at least 1 PACE prescription fill or refill during each month of the preperiod, as well as each month of the postperiod. In addition, active intervention cohort members prescribed at least 1 diabetes medication during the 360-day previsit period and the 360-day postvisit period. Because each intervention prescriber’s index date was the date of their own educational visit, the actual dates defining the pre- and postintervention periods varied across the prescribers. The academic detailing program was only offered in selected counties in Pennsylvania, and was targeted to primary care prescribers who saw large numbers of PACE patients. Based on these considerations, we used propensity score matching25-27 to identify a comparison group of prescribers who were located in nondetailed Pennsylvania counties but were similar to the detailed prescribers in their practice characteristics. For the propensity analysis, multivariate logistic regression was first used to predict intervention cohort membership from baseline prescriber characteristics within the counties where detailing had been conducted. The baseline measures were assessed during the 6-month period of September 2012 through February 2013, a period that preceded the intervention dates for all prescribers. This period was chosen to ensure that no measures that reflected the study outcomes were inadvertently used as predictors in the propensity analysis. The propensity logistic regression coefficients, which are a weighted composite of variables that maximally differentiate the detailed from nondetailed prescribers within the intervention counties, were then used to score the data for all nondetailed prescribers who practiced in the Pennsylvania counties where the intervention was not offered. Finally, a 1:1 optimal matching, with a maximum radius using a SAS macro,29 was used to match each detailed prescriber to the nonintervention county prescriber with the closest matching logit of the propensity score, provided that the comparison prescriber was located in a county with a similar level of urbanization and also met the same basic activity requirements outlined earlier for the intervention group. Each comparison group prescriber was assigned the same index date as the intervention prescriber to whom they were matched. This ensured that the 2 groups were balanced in terms of the actual dates of the pre- and postprescribing measurement periods to minimize confounding from secular prescribing trends. Covariate balance for the baseline general prescribing characteristics included in the propensity model was evaluated using standardized mean differences.30,31 The final matched group of 574 nondetailed prescribers constituted the comparison group. Four prescribing outcome measures were evaluated, including (1) the proportion of a prescriber’s patients with diabetes who received metformin, (2) the proportion of a prescriber’s patients with diabetes and hypertension who received an ACE inhibitor or an ARB, (3) the proportion of a prescriber’s patients with diabetes who received a statin, and (4) the proportion of a prescriber’s sulfonylurea prescriptions that were for long-acting agents. The interrupted time series analysis was conducted first on the intervention group’s time series alone, to examine the changes in trend that occurred within the detailed prescriber group, and then on the difference between the intervention and the comparison groups, to evaluate the differences in prescribing trends in the 2 study groups. Wilkes University Institutional Review Board approval was secured for this research. All statistical analyses were conducted using SAS for Windows, version 9.4 (SAS Institute Inc; Cary, NC). 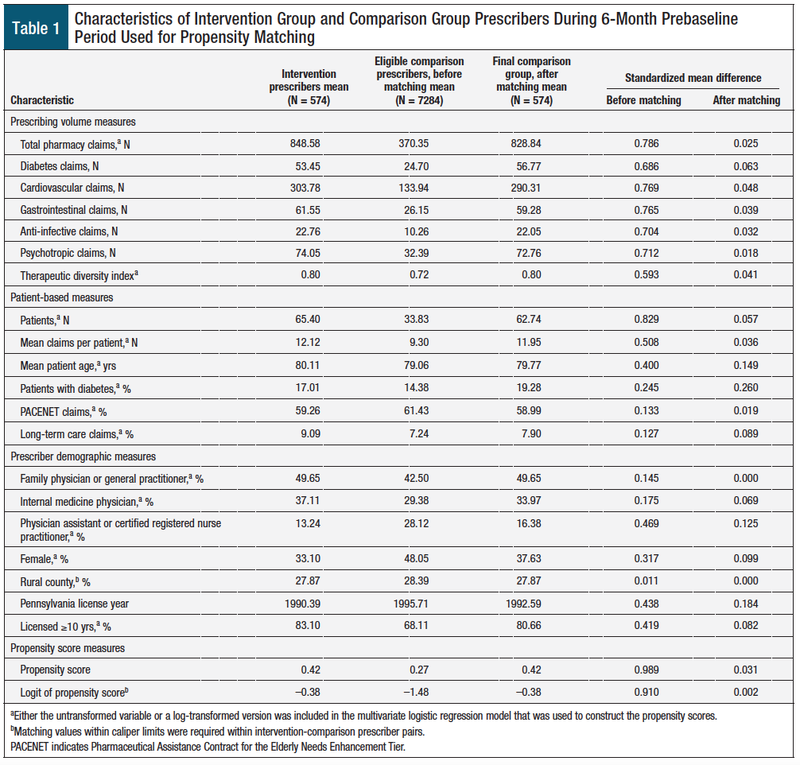 Table 1 presents descriptive data on the general prescribing characteristics at baseline for the intervention cohort of active prescribers who received an academic detailing intervention (N = 574), the baseline pool of eligible comparison prescribers before propensity score matching was conducted (N = 7284), and the final ­comparison group of prescribers (N = 574) who were matched to intervention prescribers. Table 1 also shows the standardized mean differences for the compared variables before and after propensity score matching. Before propensity matching, the intervention cohort displayed higher prescribing claims and higher patient volume than the nonintervention prescribers across all therapeutic classes examined. This reflects that the PACE academic detailing program was primarily targeted to high-volume prescribers. Relative to all eligible nonintervention prescribers, intervention prescribers were also more likely to be family practice, general practice, or internal medicine physicians than physician assistants or certified nurse practitioners. In addition, intervention prescribers had practiced in Pennsylvania longer and were less likely to be female than in the comparison group. After propensity score matching, the intervention and comparison groups were well-balanced across all the baseline characteristics examined, as was evidenced by the standardized mean differences that were considerably below the threshold of 0.25 that was recommended by several authors for all measures,30,31 with the exception of the percentage of patients with diabetes for which the standardized difference was 0.26. 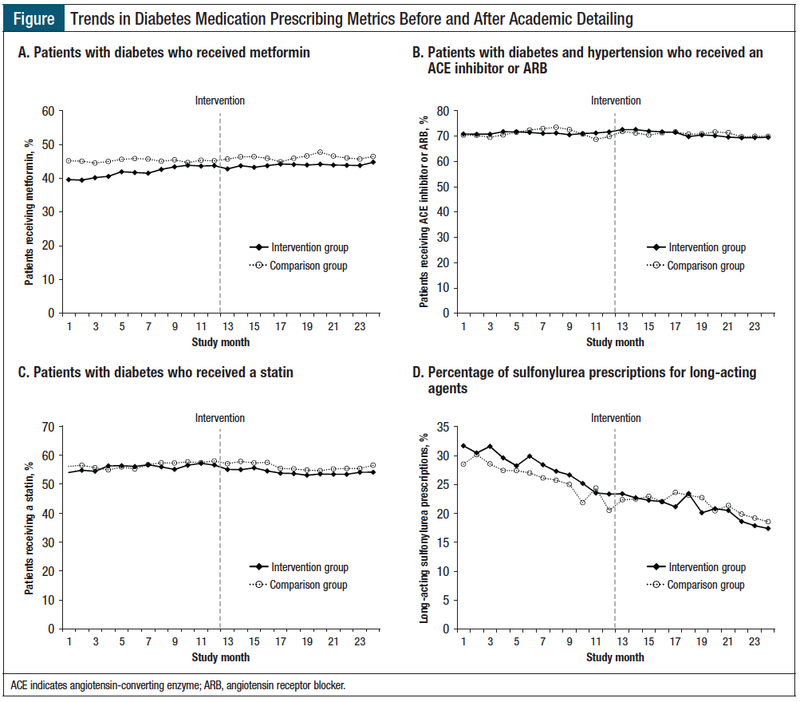 The Figure shows the graphed time series for each of the 4 diabetes medication prescribing metrics that were evaluated. For each metric, the mean values for the intervention cohort and the comparison group are graphed across all 24 months of the study. Table 2 and Table 3 provide the results of the interrupted time series segmented regression analysis. Specifically, Table 2 provides the segmented regression results for the intervention cohort alone. This regression series evaluates trends in the intervention group before, immediately after, and during the year after the academic detailing intervention, without respect to differences between the intervention and comparison group trends. 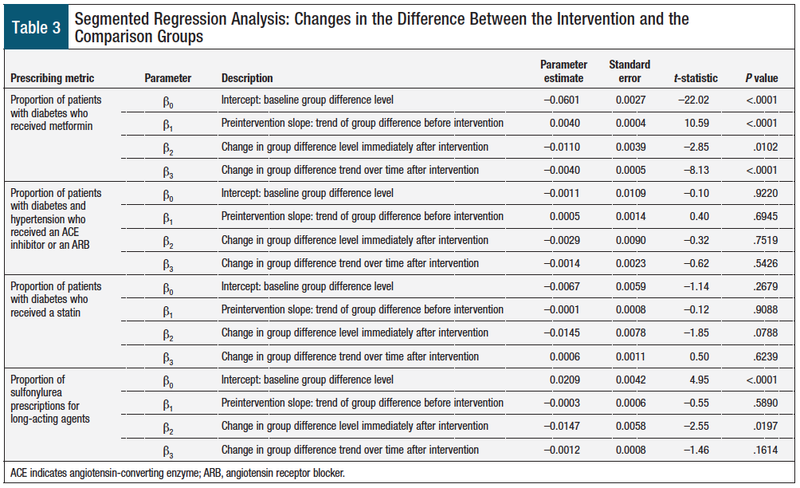 Table 3 displays the results of the segmented regression analysis of the difference between the intervention and the comparison groups for each metric. Metformin prescribing changes. 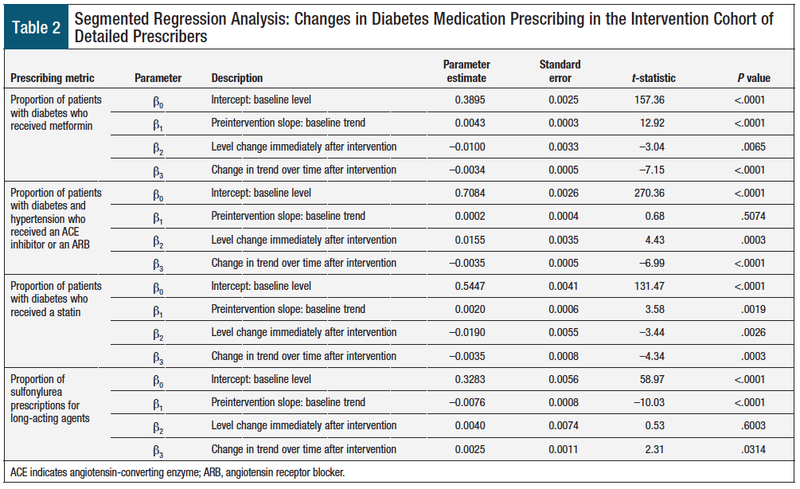 As shown in Table 2, the baseline estimated mean proportion of the detailed prescribers’ patients with diabetes who were receiving metformin before the intervention was approximately 39% (β0 = 0.3895; P <.0001). During the preintervention year, the proportion of patients receiving metformin was modestly but steadily increasing by an average of 0.43 percentage points (β1 = 0.0043; P <.0001) per month. There was a small but significant decrease in the level of metformin prescribing immediately after the intervention (β2 = –0.01; P = .0065). During the 12 months after the intervention, there was a significant reduction in the slope of change in metformin prescribing (β3 = –0.0034; P <.0001). Although metformin use continued to increase slightly on a month-to-month basis (the overall slope in the post­period was equal to the sum of β1 + β3, which remained positive), the slope of increase was smaller in the postintervention months than in the preintervention months. There were several differences between the prescriber groups in their metformin prescribing trends (Figure, Table 3). The use of metformin was initially lower in the intervention cohort than in the comparison group (β0 = –0.0601; P <.0001). This difference was reduced over time before the intervention, because the use of metformin increased in the intervention cohort (β1 = 0.0040; P <.0001). After the intervention, small but significant increases in group divergence occurred, and the intervention group continued to have lower metformin prescribing levels than the comparison group. ACE inhibitor/ARB prescribing changes. Within the intervention prescriber cohort, the estimated mean baseline proportion of patients with diabetes and hypertension who were receiving an ACE inhibitor or an ARB was 71% (β0 = 0.7084), and there was no significant month-to-month trend, either upward or downward, in ACE inhibitor and ARB prescribing before the intervention (Table 2). There was a small but significant abrupt increase in the level of ACE inhibitor or ARB use immediately after the intervention (β2 = 0.0155; P = .0003), followed by a leveling off during the postintervention year. As shown in Table 3, no apparent significant differences were found in ACE inhibitor or ARB prescribing between the intervention and the comparison groups before, immediately after, or during the year after the academic detailing intervention. Statin prescribing changes. The baseline estimated mean proportion of patients with diabetes who were receiving a statin was approximately 54% in the intervention cohort (Table 2; β0 = 0.5447), and the proportion of patients receiving a statin was slightly increasing in the months before the intervention (Table 2; β1 = 0.002; P = .0019). There was a small but significant reduction in the mean level of statin use immediately after the intervention, followed by a slight downward change in the monthly trend during the 12 months after the intervention. No significant changes in the group differences were observed before, immediately after, or in the 12 months after the intervention (Table 3). 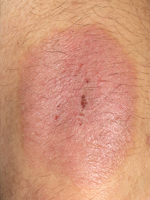 Long-acting sulfonylurea prescribing changes. For the intervention cohort at the beginning of the preintervention period, the estimated mean proportion of sulfonylureas that were long-acting was approximately 33% (Table 2; β0 = 0.3283). Long-acting sulfonylurea prescribing was initially greater in the intervention cohort than in the comparison group (Table 3; β0 = 0.0209; P <.0001). Before the intervention, the proportion of sulfonylurea prescriptions that were long-acting was steadily declining by an average of 0.76 percentage points per month in the intervention cohort (Table 2; β1 = –0.0076; P <.0001), a trend that did not differ significantly from that of the comparison group. However, an abrupt decrease in the group difference was observed immediately after the intervention (Table 3; β2 = –0.0147; P = .0197). This change remained in effect, and did not significantly increase or decrease with additional time after the intervention (Table 3; β3 = –0.0012; P = .1614). No significant trend differences were observed between the intervention and the comparison groups with respect to the 4 core metrics over the time period of this study. However, the intervention represented a second or third diabetes-focused academic detailing session for many of the prescribers in the intervention group. The graphed time series data (see Figure) suggest that ceiling effects are likely, with relatively small room for improvement at the group level. The core metrics measured here have been standard of care for diabetes care for quite some time before 2013; therefore, the results are not completely unexpected. By 2013, prescribers in the intervention and the comparison groups were largely following the practice recommendations and the standards of care, which is consistent with a ceiling effect. In 2009, the PACE academic detailing program implemented Salesforce, a cloud-based software application that provides the framework for social interaction (ie, the encounter visit documentation between the academic detailer and the provider). The transition from the former manual record system to this cloud-based system greatly enhanced the quality and completeness of the encounter data. The present study has important strengths, including the use of interrupted time series, a powerful quasiexperimental methodology, to model the prescribing changes before and after the intervention. The creation of a propensity score–matched comparison group based on the providers’ demographic and practice characteristics is a second key strength, because it enabled us to focus on group differences in prescribing changes while controlling for potential secular trends. The high value and acceptance of the PACE educational outreach efforts have been sustained in many cases for more than 10 years. These trusted relationships can serve as direct conduits to primary care providers. There is inherent value to a public program such as PACE in having such conduits to primary care providers, especially in the current political climate of reduced size and reach of the federal government. Before the 2009 implementation of Salesforce, the academic detailing data were incomplete and could not be used for the present study. The present study is based on prescribing changes after likely repeated exposure to academic detailing rather than after the first wave of diabetes training in 2007, which is an important limitation of this study. It is possible that the benefits of academic detailing might have been expressed and gone undetected earlier in the 2007- and/or 2009-focused module encounters. Subsequent exposure to the same educational topic might have led to little incremental improvement in antidiabetes medication prescribing. Furthermore, the widespread dissemination of diabetes treatment guidelines outside of the PACE academic detailing program might have further contributed to a ceiling or saturation effect. This highlights the importance of ensuring that interventions are aimed at measurable gaps in clinical performance. In addition, by 2013, for clinicians treating older patients with diabetes, there might have been relatively little room to change medication therapies for patients who were not currently receiving evidence-based care implicit in the 4 specific metrics we measured. Providers’ decision-making could have been complicated by multiple comorbidities, declining kidney or liver function, intolerance to medications, clinical inertia, or adverse drug reactions. Finally, many patient-related reasons may contribute to a lack of change in diabetes medications use that are independent of the academic detailing encounter, including multicausal nonadherence, the inability to afford medications, a lack of benefits or perceived harm from medications, or a past medical history of a nonresponse to a newly prescribed trial of a medication. Such concerns may be particularly salient for the present study based on the PACE population demographics. As a result of the PACE program’s income eligibility criteria and adverse selection into the program, PACE cardholders are older on average and have greater comorbidities than the general elderly population. The study findings did not demonstrate group differences in prescribing trends as a result of the intervention, which is consistent with a ceiling effect in the measured metrics, suggesting that most prescribers in both groups were following diabetes guidelines before and after the intervention. Nevertheless, the relevance of academic detailing has become more critical, because providers are under constant bombardment from a cacophony of voices. Industry-driven marketing of medications to prescribers is associated with increased profits for drug manufacturers. Pharmacy benefit managers may be incentivized by rebates from drug manufacturers to influence the market share of particular drugs. Many resources, in print and web-based, can be accessed by patients and by providers. At least some of these resources contain biased information that advocates for specific drugs, whereas others make claims that are based on opinion rather than on scientific evidence. By contrast, educational outreach or academic detailing deserves the distinction of providing trusted, nonbiased evidence-based information to assist providers in achieving the best possible health outcomes in a constantly changing environment. The metrics that define successful academic detailing interventions may be difficult to isolate and clearly assess. However, the recognition of academic detailing as a valued, relevant, and valid source of unbiased information that is consistently welcomed by providers speaks to the continued need for this outreach and perhaps to the need for a larger role in the future. Finally, as drug prices continue to rise for brand-name and generic drugs, and as total consumer out-of-pocket medication costs increase, there are calls to loosen the regulatory burden of the US Food and Drug Administration (FDA) in the drug approval process to decrease the expenses associated with this procedure. The FDA is the last line of defense to ensure that the new drugs approved for use by patients are safe and effective. Academic detailing may be essential to the support of evidence-based care of patients and is a consistent, reliable, and trusted source of information for providers. Future research using additional study designs may offer greater opportunity to identify the specific provider characteristics that best explain the differences in prescribing behaviors. Other opportunities for future research include comparisons of targeted versus comparison group prescribing based on geographic location, as well as demographic factors not addressed in this study that may also influence prescribing patterns. In addition to standard-of-care metrics, it may also be beneficial to explore the differences between the detailed and nondetailed prescribers in the use of non–evidence-based, but highly marketed, drugs. Dr Trombetta and Dr Heller have no conflicts of interest to report. Dr Trombetta is Associate Professor, Pharmacy Practice, Wilkes University, School of Pharmacy, Wilkes-Barre, PA; Dr Heller is Senior Health Outcomes Scientist, Magellan Rx Management/PACE, Harrisburg, PA.
Avorn J, Soumerai SB. Improving drug-therapy decisions through educational outreach: a randomized controlled trial of academically based “detailing.” N Engl J Med. 1983;308:1457-1463. Soumerai SB, Avorn J. Principles of educational outreach (‘academic detailing’) to improve clinical decision making. JAMA. 1990;263:549-556. Yeh JS, Van Hoof TJ, Fischer MA. Key features of academic detailing: development of an expert consensus using the Delphi method. Am Health Drug Benefits. 2016;9(1):42-50. Van Hoof TJ, Harrison LG, Miller NE, et al. Characteristics of academic detailing: results of a literature review. Am Health Drug Benefits. 2015;8(8):414-422. Fischer MA, Avorn J. Academic detailing can play a key role in assessing and implementing comparative effectiveness research findings. Health Aff (Millwood). 2012;31:2206-2212. Avorn J, Fischer M. ‘Bench to behavior’: translating comparative effectiveness research into improved clinical practice. Health Aff (Millwood). 2010;29:1891-1900. Blitz DA, Mallen JR, Kwiatkowski TG, et al. Not for industry only: medical students and office-based academic detailing the PIVOT (Pregnant women Influenza Vaccine Optimization Team) initiative. Adv Med Educ Pract. 2015;6:323-327. Harris AHS, Bowe T, Hagedorn H, et al. Multifaceted academic detailing program to increase pharmacotherapy for alcohol use disorder: interrupted time series evaluation of effectiveness. Addict Sci Clin Pract. 2016;11:15. Jin M, Gagnon A, Levine M, et al. Patient-specific academic detailing for smoking cessation: feasibility study. Can Fam Physician. 2014;60:e16-e23. Ly E, Peddecord KM, Wang W, et al. Student column: using academic detailing to improve childhood influenza vaccination rates in San Diego. Public Health Rep. 2015;130:179-187. Ndefo UA, Norman R, Henry A. Academic detailing has a positive effect on prescribing and decreasing prescription drug costs: a health plan’s perspective. Am Health Drug Benefits. 2017;10(3):129-133. Solomon DH, Van Houten L, Glynn RJ, et al. Academic detailing to improve use of broad-spectrum antibiotics at an academic medical center. Arch Intern Med. 2001;161:1897-1902. O’Brien MA, Rogers S, Jamtvedt G, et al. Educational outreach visits: effects on professional practice and health care outcomes. Cochrane Database Syst Rev. Oct 2007:CD000409. Ostini R, Hegney D, Jackson C, et al. Systematic review of interventions to improve prescribing. Ann Pharmacother. 2009;43:502-513. Polinski JM, Brookhart MA, Katz JN, et al. Educational outreach (academic detailing) regarding osteoporosis in primary care. Pharmacoepidemiol Drug Saf. 2005;14:843-850. Solomon DH, Brookhart MA, Polinski J, et al. 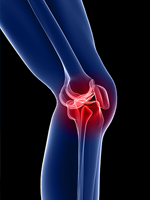 Osteoporosis action: design of the healthy bones project trial. Contemp Clin Trials. 2005;26:78-94. Centers for Disease Control and Prevention. National Diabetes Statistics Report, 2017: estimates of diabetes and its burden in the United States. www.cdc.gov/diabetes/pdfs/data/statistics/national-diabetes-statistics-report.pdf. Accessed March 14, 2019. Fischer MA. Academic detailing in diabetes: using outreach education to improve the quality of care. Curr Diab Rep. 2016;16:98. Pill R, Stott NCH, Rollnick SR, Rees M. A randomized controlled trial of an intervention designed to improve the care given in general practice to Type II diabetic patients: patient outcomes and professional ability to change behaviour. Fam Pract. 1998;15:229-235. Ricordeau P, Durieux P, Weill A, et al. Effect of a nationwide program of educational outreach visits to improve the processes of care for patients with type 2 diabetes. Int J Technol Assess Health Care. 2003;19:705-710. Wagner AK, Soumerai SB, Zhang F, Ross-Degnan D. Segmented regression analysis of interrupted time series studies in medication use research. J Clin Pharm Ther. 2002;27:299-309. Bernal JL, Cummins S, Gasparrini A. Interrupted time series regression for the evaluation of public health interventions: a tutorial. Int J Epidemiol. 2017;46:348-355. Avorn J. Academic detailing: “marketing” the best evidence to clinicians. JAMA. 2017;317:361-362. Pennsylvania Department of Aging. Pharmaceutical Assistance Contract for the Elderly Annual Report to the Pennsylvania General Assembly: January 1-December 31, 2016. Harrisburg, PA; 2016. www.aging.pa.gov/publications/annual-­reports/Documents/2016%20PACE%20Annual%20Report.pdf. Accessed March 25, 2019. Austin PC. An introduction to propensity score methods for reducing the effects of confounding in observational studies. Multivariate Behav Res. 2011;46:399-424. D’Agostino RB Jr. Propensity score methods for bias reduction in the comparison of a treatment to a non-randomized control group. Stat Med. 1998;17:2265-2281. Rosenbaum PR, Rubin DB. Constructing a control group using multivariate matched sampling methods that incorporate the propensity score. Am Stat. 1985;39:33-38. Donohue J, O’Malley AJ, Horvitz-Lennon M, et al. Changes in physician antipsychotic prescribing preferences, 2002-2007. Psychiatr Serv. 2014;65:315-322. Murphy B, Fraeman KH. A general SAS macro to implement optimal N:1 propensity score matching within a maximum radius. Paper presented at the SAS Global Forum; April 2-5, 2017; Orlando, FL. Rubin DB. Using propensity scores to help design observational studies: application to the tobacco litigation. Health Serv Outcomes Res Methodol. 2001;2:169-188. Stuart EA. Matching methods for causal inference: a review and a look forward. Stat Sci. 2010;25:1-21.